From September 1993 to March 2012 the Hobgoblin served: 6695 different beers! Tucked on the corner of Broad Street amid the coffee shops we are proud to be a back-street locals pub right in the centre of town. 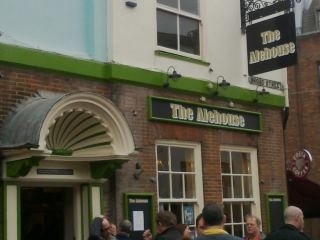 There is said to have been a pub on this site for over 300 years and after around 150 years as the London Tavern and 18 as the Hobgoblin, the Alehouse continues to offer customers a wide range of draught and bottled drinks. On the bar, as well as a Czech lager, and Guest Craft Keg beers, you will find three handpumps dedicated to West Berkshire brewery's range and six rapidly changing guest ales. We are also well known for the variety of traditional draught cider and perry that we have on offer and if none of those take your fancy why not try one of our continental bottled beers or a glass of mead? We run a quiz on the first Monday of every month with half the proceeds going towards our resident charity - The Thames Valley and Chiltern Air Ambulance - and the other half towards the prize fund. A Wee Dram? We are pleased to announce some recent additions to our range of Single Malts, with the introduction of Ardbeg, Bruichladdich Laddie, Bunnahabhain, Caol Ila and Bushmills. Enjoy.